9 Gloucester is located on the SE corner of Gloucester and Marlborough, with 7 Gloucester to the north, across Marlborough, 11 Gloucester to the south, 322 Marlborough to the east, and 334 Marlborough to the west, across Gloucester. 9 Gloucester (324 Marlborough) was designed by architect Willard Thomas Sears (of the firm of Cummings and Sears) and built for him ca. 1872, one of four contiguous houses (9-11-13-15 Gloucester) designed as two symmetrical pairs united by an uninterrupted mansard roof. At about the same time, he also designed 322 Marlborough on the adjoining lot to the east. Willard Sears acquired the land for 9-11-13-15 Gloucester and 322 Marlborough in April of 1872 through two purchases: the corner lot with a 56 foot frontage on Marlborough from the estate of William P. Mason, and the lot to the east with a 24 foot frontage from Harvey Jewell. He subdivided the two lots into an 18 foot 6 inch lot for 322 Marlborough and four 61 foot 6 inch lots (east-west) for 9-11-13-15 Gloucester. All of the land originally was part of one of several parcels purchased from the Boston Water Power Company on January 29, 1866, by a real estate investment trust formed by John Templeman Coolidge, Franklin Evans, and Charles Henry Parker. The trust subdivided the parcel into lots, which it sold to investors and builders, who then frequently resold the lots to others. Click here for an index to the deeds for 9 Gloucester. Willard Sears and his wife, May (Motte) Sears, made 15 Gloucester their home. 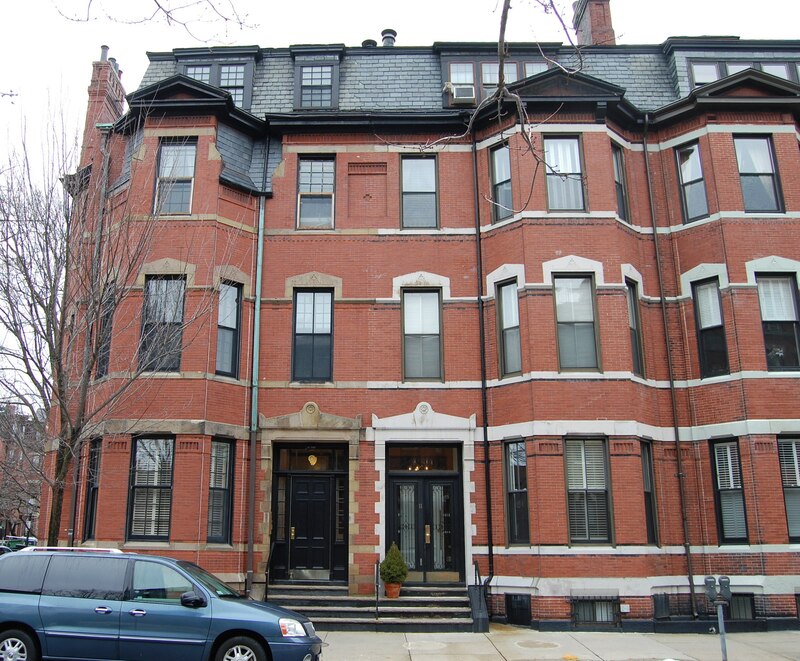 He sold he lot at 322 Marlborough to his brother-in-law and sister, Charles W. Seabury and Elizabeth Willard (Sears) Seabury, in July of 1872, before the house was completed, and kept 9-11-13 Gloucester as rental property. The deeds for the houses at 11-13-15 Gloucester included a 3 foot 6 inch wide easement at the eastern boundary to provide passage to the alley for those houses and drainage to the alley for 9-11-13-15 Gloucester. 9 Gloucester appears to have been vacant for several years after it was completed. By the 1877-1878 winter season, it was the home of wine importer and wholesale liquor merchant John Eliot Atkins. He previously had lived at the Hotel Pelham (southwest corner of Boylston and Tremont). He and his wife, Helen M. (Eastman) Atkins were separated (and were divorced by 1900). On April 25, 1881, 9-11-13 Gloucester were purchased from Willard Sears by his first cousin, Joshua Montgomery Sears. He and his wife, Sarah Carlisle (Carlile) (Choate) Sears, lived at 12 Arlington. He was a real estate investor and purchased the houses as rental property. John Atkins continued to live at 9 Gloucester during the 1884-1885 winter season, but moved thereafter to 306 Beacon. By the 1885-1886 winter season, 9 Gloucester was the home of Robert F. Clark and his wife, Marguerita C. (Jones) Clark. They previously had lived at 38 Chestnut. Robert Clark was a stockbroker and served as Chairman of the Boston Police Commission. He was the founding president of the Boston Athletic Association, formed in 1887. Marguerita Clark died in June of 1904. Robert Clark continued to live at 9 Gloucester. Their son, Robert Jones Clark, a real estate and insurance broker, lived with him. In September of 1906, Robert Clark married again, to Susan Day Kimball. Prior to their marriage, she had lived at 317 Beacon with her brother-in-law and sister, William and Mary (Kimball) Kehew. 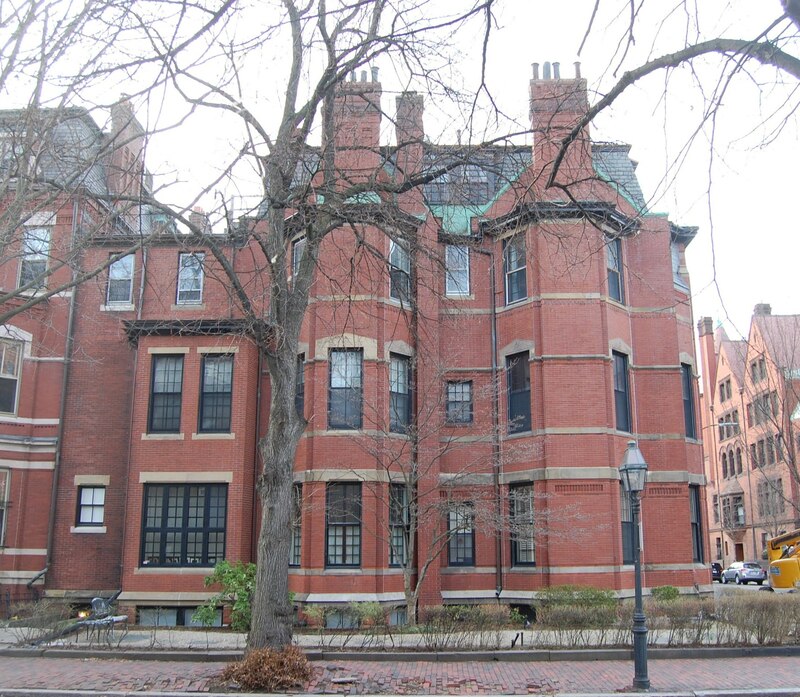 After their marriage, Robert and Susan Clark lived at 9 Gloucester. On March 13, 1907, the Boston Globe reported that Robert Clark had entered into an agreement with the Estate of J. Montgomery Sears (who had died in June of 1905) to purchase 9 Gloucester. The agreement was not finalized, and the Clarks moved instead to 317 Beacon. On August 5, 1907, 9 Gloucester was purchased from the estate of Joshua Montgomery Sears by Donald Gordon, an attorney. He and his wife, Louisa Raynor (Ayer) Gordon, made it their home. They previously had lived next door, at 11 Gloucester. They continued to live at 9 Gloucester during the 1914-1915 winter season, after which they moved to Lincoln. On June 15, 1915, 9 Gloucester was purchased from Donald Gordon by Charles Taylor Lovering, Jr., a stockbroker. He and his wife, Ellen Brewer (Lyman) Lovering, made it their home. They previously had lived in an apartment at 371 Commonwealth. 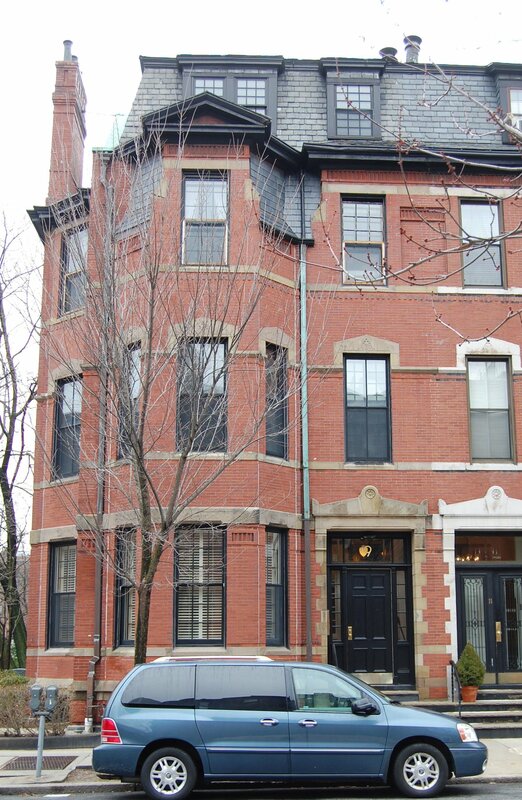 The June 16, 1915, Boston Globe article reporting the sale noted that the Loverings would occupy the house “after extensive improvements.” These included the construction of a two-story rear addition between 9 Gloucester and 322 Marlborough. On November 15, 1915, Ethel White, owner of 322 Marlborough, sold Charles Lovering the western half of the party wall of her house so that he could use it as the eastern wall of an addition. The addition was designed by architects Bigelow and Wadsworth. From mid-1917 to mid-1919, Charles Lovering was serving in the US Army, including serving in France from June of 1918 to February of 1919. During this period, the Loverings leased 9 Gloucester to others. They lived at 42 Fairfield during the 1917-1918 winter season and at 451 Marlborough during the 1918-1919 season. During the 1917-1918 winter season, 9 Gloucester was the home of Philip Stockton, president of the Old Colony Trust Company, and his wife, Margaret (Head) Stockton. They also maintained a home in Manchester. They previously had lived at 173 Commonwealth, and by the 1918-1919 season, they had moved to 278 Beacon. During the 1918-1919 winter season, 9 Gloucester was the home of leather and wool merchant Louis Rosenthal and his wife, Mabel (Rothschild) Rosenthal. 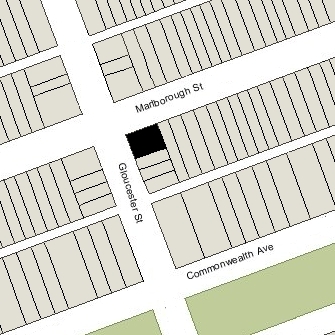 They previously had lived at 7 Marlborough, and by the 1919-1920 season had moved to 261 Clarendon. The Loverings resumed living at 9 Gloucester in 1920. They continued to live there during the 1924-1925 winter season but moved thereafter to an apartment at 8 Gloucester; they divorced soon thereafter and he moved to New York City. During the 1925-1926 winter season, 9 Gloucester was the home of bond broker Eben Shearman Doolittle and his wife, Alice Watson (Lowery) Doolittle. They previously had lived at 12 Charles River Square. In May of 1926, they purchased and subsequently moved to 321 Marlborough. On August 26, 1926, 9 Gloucester was purchased from Charles Lovering by Frances (Sturgis) Clark, the wife of investment banker Franklin Haven Clark. They previously had lived at 31 Hereford. They also maintained a home in Nahant. In June of 1930, the Clarks applied for (and subsequently received) permission to add a third floor to the rear addition between 9 Gloucester and 322 Marlborough. The remodeling was designed by architects Perry, Shaw, and Hepburn. The Clarks continued to live at 9 Gloucester until his death in July of 1936. On October 21, 1936, 9 Gloucester was purchased from Frances Clark by Bessie Everett (Griffin) Norris, the wife of real estate and insurance broker Forris Wood Norris. In March of 1938, she applied for (and subsequently received) permission to convert it into four apartments. In October of 1940, Forris W. Norris, received permission to repair fire damage to the basement and first floor of the house, which at that point contained five apartments. On December 27, 1948, 9 Gloucester was acquired from Bessie Norris by John R. Watson, trustee of the Colonial Realty Trust. On June 1, 1949, 9 Gloucester was acquired from John Watson by Augusta McIlhaney (Williams) Ritchie, the former wife of Oliver Henderson Ritchie, a career Naval officer. She lived in one of the apartments; their daughter, Caroline Ritchie, lived with her. They previously had lived in Newton. On March 20, 1956, 9 Gloucester was acquired from Augusta Ritchie by real estate dealer Shirley Clifford Speed. The property changed hands and on August 4, 1961, was acquired by Miss Joyce W. Huxley, a secretary. She lived in Needham. In the early 1970s, she married to Victor Boyd Acox and moved to Newfields, New Hampshire. On December 30, 1975, 9 Gloucester was purchased from Joyce Huxley Acox by Stephen J. Nettel of Brunswick Hills, New York. The property changed hands and on August 31, 1983, was purchased by real estate dealers Daniel A. Mullin and Robert C. Mullin, as trustees of the Mullin Family Trust. 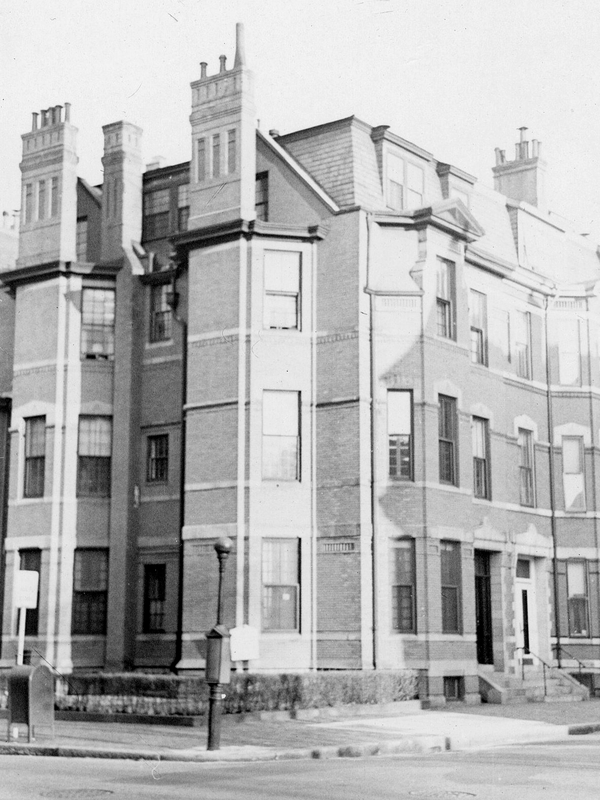 On November 30, 1983, they converted the property into five condominium units, the Nine Gloucester Street Condominium.